Crazy 80's Video Slot Review - Casino Answers! 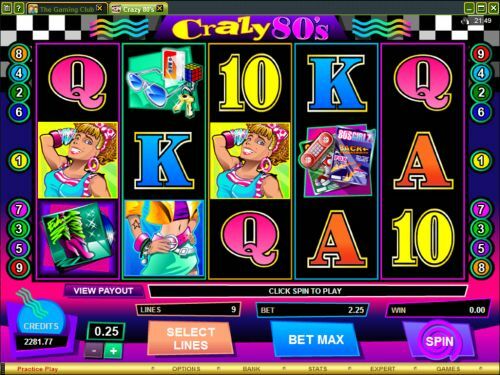 Crazy 80’s is a 5-reel, 9-line video slot developed by Microgaming, featuring a wild symbol and scatter wins. You can play the Crazy 80’s video slot at Bovada. The top-paying symbol on the Crazy 80’s slot machine is the 80’s Girl. By hitting 5 80’s Girl symbols on a selected payline, you will win the 5000 coin top jackpot. The scatter symbol is the Record symbol. You can get a scatter win by hitting three scatter symbols or up to 50X your total bet by hitting five scatters. Win these payouts by playing Crazy 80’s at Bovada. The Boom Box is the wild symbol on the Crazy 80’s slot game. It doesn’t pay out by itself, but the symbol will substitute for all other symbols on the Crazy 80’s video slot except for the Scattered Record symbol. The Crazy 80’s casino game has an autoplay mode with advanced settings. To access the Crazy 80’s slot machine’s autoplay feature, hit “Expert” and you can play 5 or 10 autoplay spins or hit the “Auto Play” button to open up advanced settings. You can set the number of spins (5, 10, 25, 50, 100, 250 and 500), number of seconds between spins (0, 0.25, 0.50, 0.80 and 1.50), stop once all spins are complete, stop when jackpot is won, stop if a win exceeds or equals ($25, $50, $100, $250, $500, $1000 and $2500), stop on any win and stop if credits increase/decrease by ($25, $50, $100, $250, $500, $1000 and $2500). You can stop autoplay at any time on the Crazy 80’s slot machine. Crazy 80’s doesn’t really have any special features to it. It’s very basic, only really offering a wild symbol, scatter symbol and a 5000X top payout. To play the Crazy 80’s video slot, you can head over to Bovada. Can USA players play the Crazy 80s slot game for real money? American players are unable to play the Crazy 80’s video slot for real money at this time. 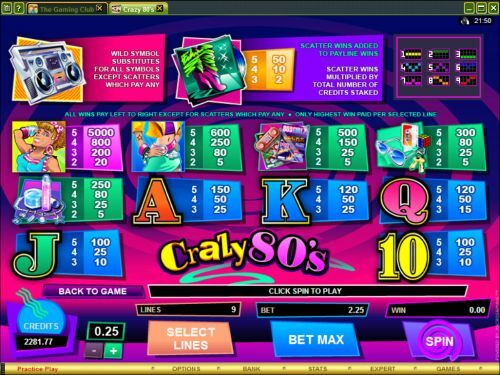 For an Eighties themed video slot you can play from the United States, please read our So 80’s Video Slot Review or play it at a Rival-powered casino such as Bovada. Can I play a free flash game of the Crazy 80s video slot? Yes, you can find the Crazy Eighties flash game on page 9 (currently) at the Bovada instant play casino. You can play it for free or real money. If you have any issues with the flash casino, try downloading the newest version of Adobe Flash Player.